Not about to rest on her laurels, Barb was already planning Book Two. I was amused that my copy of Historic Shot Glasses, when it arrived, had a plea for help unceremoniously gummed into the frontispiece. “To Purchasers of HISTORIC SHOTGLASSES: THE PRE-PROHIBITION ERA”, it read. “Descriptions (measurements & drawings of inscriptions) of additional glasses for a possible second volume would be welcomed. Several collectors have allowed me to measure and draw their collections, and if you are interested and have, say, 5 to 10 that are not included in this edition, let me know so I can keep you in mind for a possible visit to your part of the country”. 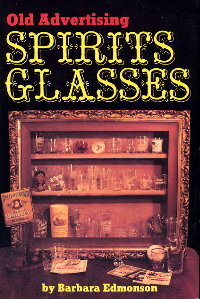 Book Two appeared in 1988 with the title: Old Advertising Spirits Glasses. The format was almost identical to Historic Shot Glasses with descriptions, measurements and drawings, but this latest volume included the results of a considerable amount of research into the origins and history of the glasses. The research started when Bob Snyder sold her his collection of photocopies of city directories from around the country. Bob had amassed these through many years of communicating with reference librarians in his quest to hunt down the owners of pre-prohibition whiskey brand names. Many of the copies were little more than lace work after Bob had clipped ads from the pages, but they still showed the street addresses and years of operation of all the major distillers, rectifiers, and wholesalers and hence could be used as a means of dating the shot glasses. Barb supplemented this with hours of painstaking work. She took to the road as time and finances allowed, traveling from one side of the country to the other in search of information and collections to catalogue. Her travels took in Ken Schwartz’ collection of western glasses and Paul Van Vactor’s Kentucky shots. 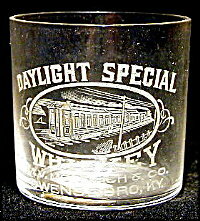 Paul kindly allowed me to photograph his collection during a visit to Louisville two years ago, and he recalled the “Daylight Special” glass shown here [Figure 6] as being Barb’s favorite. She also visited Barb and Roger Roy in Ohio. Barb Roy turned out to be as talented in reproducing the glass inscriptions as Barb Edmonson, and the two of them fastidiously cataloged and measured and drew over the course of the next few days [Figure 7]. Out east, she stayed with Sheila Sears who then lived in the Baltimore suburbs. Sheila had a collection of several hundred pre-pro shots and she recalls setting Barb up at a card table and then watching as she sketched her way through the entire collection. She visited other Maryland collectors while in the area, but the proximity to Washington DC meant that she also had access to the Library of Congress and their vast resources. 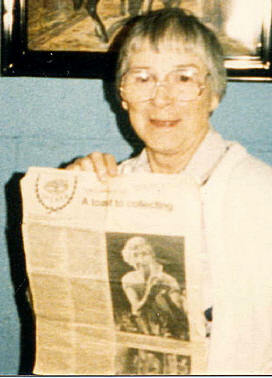 Barb described many long hours spent in the basement, tracking down information on glass manufacturers and on the history of various liquor companies. She also recalled trying to wrestle New York City directories off their shelves, only to be defeated by their size and weight. It’s difficult to know what drove her. She was primarily a collector who was as passionate about the delicate nature and fine detail of the etching on the old glasses as any individual, past or present. But the time and effort she put into cataloguing and fleshing out their background must have satisfied a greater intellectual need. “Who but some nutty old lady or man would do this, spend all this time for no money?” she quipped to the reporter from the local paper. Book Three was to have focused on glasses from eastern states, but ultimately it was not to be so. Barb’s sister Janet died in 1988, the same year that Old Advertising Spirits Glasses was published. Janet Turner was a talented artist whose works can be found in museums around the world. She had accumulated a massive collection of rare prints and Barb now redirected all of her considerable energies toward finding a permanent home for her sister’s legacy. There was also the issue of how a third book could be financed and distributed. The nineties saw Barnes & Noble and Borders grow into national chains that crushed the smaller vendors who had helped sell Barb’s first two books.